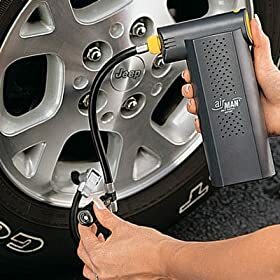 Battery powered pumps are loud, and don't provide very many filling cycles on a charge since they're only meant to be able to top off a car tire once. Also, learn to use paragraphs. Edited by CaptainSlug, 12 September 2008 - 10:03 AM. Slug, what do you think of camping battery powered pumps. I know at this point it's pointless to make battery powered semi auto/full auto guns with the Vulcan here now and all. The one my dad and I use is for air mattresses, and it puts out a good 35 cfm or so, and filled up our air mattresses completely some 10 (5 stops, 2 mattresses each time) times over the course of our camping trip. Who knows how many fills it has on a set of batteries. And each fill took a long time, like a minute and a half or so. Imagine filling a tank real quick with it repeatedly. You might be able to get more than a round in if you're not too trigger happy. And even if, just throw in some spare D batteries. An air mattress pump is usually a centrifugal fan and they can't really build up very much pressure. Usually 5psi at best. Edited by CaptainSlug, 24 July 2008 - 12:33 AM. 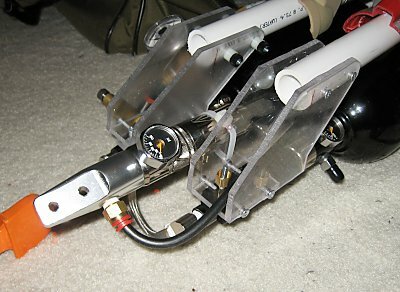 I know this somewhat of a necro, but I'd like to point out that some of those cordless electric inflators work well for filling LPA tanks. I have a VERY larg LPA tank (pushing the cumbersome limits, over 600 ci) that I fill with a cordless inflator. It takes a while to get filled to 60 psi, but it can refill it several times without recharging (the battery has been pretty impressive). I also use it in conjunction with The Unfair Gun and just refill between rounds. While we're on the topic of alternative air sources, for the last year I've been considering using the cyclaire pump system for RE-filling an LPA tank while on the move (it can't be used to fill it initially because it will overheat if used for too long, but bringing the pressure back up shouldn't be a problem). Has anybody, especially you guys over there in Britain, seen these are used these for anything? [indent=1]Ok, I have a question, my mom just bought an electric pump, it works on bikes, as well as cars...there is a gauge to show how much PSI is currently in the object it's pumping with about a 250PSI maximum, it was bought for $30. It is charged via eletric outlet and there is about a 2' hose that comes out of the front. Is that an Air Man pump? They work okay, but are loud and don't provide very many refills. Since CenterFlag products seems to have closed I have revised the original post with the newer, simpler, and cheaper setup that's built around an inline regulator. A secondary non-relieving regulator is not expressly needed due to the ability of the inline regulator to make fine adjustments. Just be very careful when setting its output level. 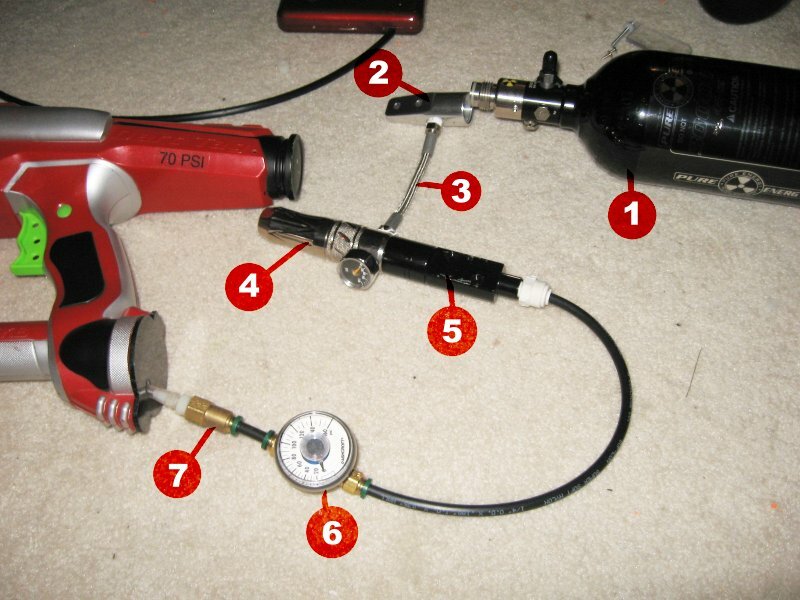 In order to avoid destroying your Nerf blaster prematurely it would be a good idea to hook the regulator up to a ball valve in order to get the output pressure set correctly beforehand. Edited by CaptainSlug, 07 September 2008 - 02:04 PM. Been running some tests with the inline regulator and the result is identical to the previous setup, but much simpler and cheaper. All that's left to do is replace the included pressure gauge with one that has a narrower pressure range. I can't stress enough that it is extremely important to use 3 wraps of teflon tape to seal the threaded connections on this setup. The new setup is cheaper to buy and easier to shop for, but this is still a fairly expensive addition to any blaster. Edited by CaptainSlug, 11 September 2008 - 12:13 AM. What kind of ranges do you think it will be getting? I love the one on the left. It really makes me want to blow the money on all the airtank equip.